ICONIC DUBLIN DEPARTMENT store Clerys is to temporarily lay off 86 staff as it continues to deal with the fallout from a storm which caused major damage within the shop. The store has remained closed since 25 July when heavy rain caused extensive damage to the building on O’Connell Street in Dublin city centre. Management said this evening that the store would “not be fully operational in the short-term”. In a statement, owners and management said that the 86 workers will be laid off for at least four weeks. The affected employees are mainly sales and back-of-house workers. The company said the workers will remain Clerys’ employees during the temporary lay-off period. Management and some other staff will remain fully employed by the department store. Owners and management of the department store met with employees and unions this afternoon to give an update on progress on refurbishing the giant store. “Plans and activity to fully refurbish the department store are well underway and management is confident that Clerys will reopen on a stronger than ever platform,” Gordon Brothers, which owns Clerys, said. Staff were told earlier this month that they may be waiting for months to return to work. 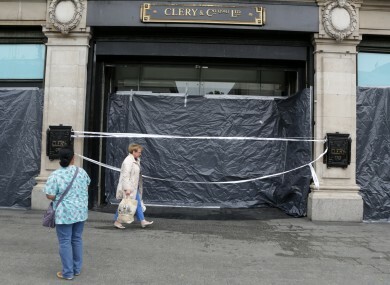 Email “Clerys lays off 86 staff 'for at least four weeks'”. Feedback on “Clerys lays off 86 staff 'for at least four weeks'”.